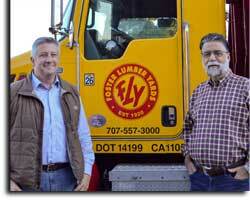 James (Jimmy) Jones and his brother Cecil purchased Foster Lumber from Gilbert Foster in 1946. 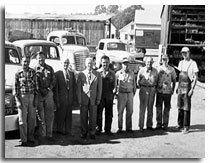 Here Jim is pictured at the Union Lumber Company in Fort Bragg, circa 1950. 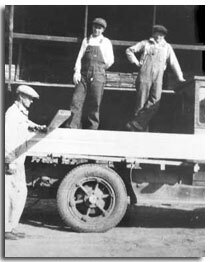 Long before purchasing Foster lumber from Gilbert Foster, the Jones family began their history of working with lumber. Their father, James, hauled lumber in the 30's to survive the great depression. GMC Cabover load with model stock that was destined to be ran to patterns. Note, 3-digit phone number "251", they were easier to remember back then. Trucking safety regulations were a little bit different in the old days. Here is an in-bound delivery of wood double hung windows, truck is slightly overloaded. (L-R) C. Jones, J. Jones, E. Crowell, P. Lewis, V. Sagasky, M. North, L. Primrose, E. Jones & C. Lunsted. Note, truck colors had changed from black to red and yellow. 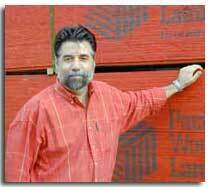 Foster Lumber has always been involved in numerous community activities and fundraisers. 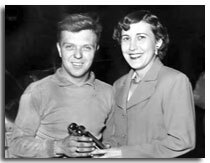 Here, Betty Jones, or "Mrs. J" as she was often called, presents the winner's trophy at an auto race sponsored by Foster Lumber. 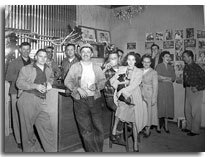 It has been a long tradition to satisfy our customer's needs; there was a time when the company had an in-house cocktail lounge, above Foster Lumber employees enjoy a drink after work. This hard-working group were more than co-workers, they became family. Today it's much the same as it was then (minus the FLY bar...). This party is being held at the private company lounge. 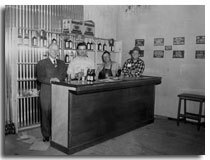 Building close relationships with our customers has been a practice since 1920. Misunderstandings seldom occur between friends. Corner of Maryland and Napa. The truck is loaded with lumber, roofing and windows destined for a new house project in Vallejo. FLY at the corner of Maryland and Napa in Vallejo, looking west. The yard was small and tight cornered but a lot of lumber went out of there. The early 50's brought modernization. 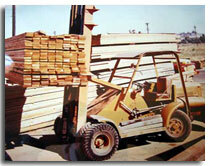 Here is one of the company's first forklifts. In those days, many forklifts included parts left over from WWII vehicles. 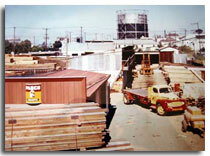 As the business grew, so did the fleet of trucks to deliver material to customer's jobsites. led by Steve Patterson, the third generation President & CEO of Central Valley. Dave pictured above left. Steve Patterson and Dave above right.